Why are young people dropping out of religious institutions? Can anything be done to reverse the trend? In Got Religion?, Naomi Schaefer Riley examines the reasons for the defection, why we should care, and how some communities are successfully addressing the problem. The traditional markers of growing up are getting married and becoming financially independent. But young adults are delaying these milestones, sometimes for a full decade longer than their parents and grandparents. This new phase of “emerging adulthood” is diminishing the involvement of young people in religious institutions, sapping the strength and vitality of faith communities, and creating a more barren religious landscape for the young adults who do eventually decide to return to it. Yet, clearly there are some churches, synagogues, and mosques that are making strides in bringing young people back to religion. Got Religion? 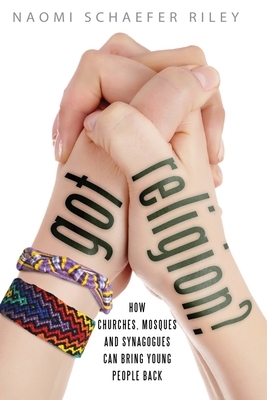 offers in-depth, on-the-ground reporting about the most successful of these institutions and shows how many of the structural solutions for one religious group can be adapted to work for another. The faith communities young people attach themselves to are not necessarily the biggest or the most flashy. They are not the wealthiest or the ones employing the latest technology. Rather, they are the ones that create stability for young people, that give them real responsibility in a community and that help them form the habits of believers that will last a lifetime. Naomi Schaefer Riley is a weekly columnist for the New York Post and a former Wall Street Journal editor. She is the author of Til Faith Do Us Part: How Interfaith Marriage Is Transforming America, God on the Quad, and The Faculty Lounges. She lives with her husband, Jason, and their three children in suburban New York City.